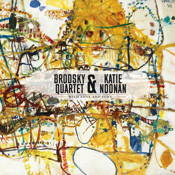 Inspired by the evocative poetry of Judith Wright, Noonan and the Brodsky Quartet perform specially commissioned works by Australian composers including Carl Vine, Elena Kats-Chernin, Richard Tognetti, Iain Grandage, Andrew Ford, David Hirschfelder, Paul Grabowsky, Paul Dean and John Rodgers. This is an exquisite, spine-tingling performance of world-class proportion, with a distinctly Australian voice. For more information on this CD visit the KIN Music website.